That’s what at least some of your visitors are saying when they arrive at your landing page and start taking in the claims it makes. And if you can’t back up what you’re saying, they’re likely to hold your offer at arm’s length. Fortunately, there are a hundred ways to make your landing page exude trustworthiness and authority. Some—think testimonials and reviews—are obvious. Others are much subtler, little things that whisper “This place is legit” as visitors scroll. Can you spot the different kinds of proof in this month’s roundup of great landing pages from the Leadpages community? Follow along as we analyze exactly how the 10 best pages we’ve discovered lately support their claims, then download 8 of the landing page templates that made these powerful pages possible. If you already use Leadpages, you can find these templates in the template library—just type the name into the search bar. If you don’t, you’ll need to do enough coding to modify the files for your business, or just hand them to whoever handles your website. What Stands Out: First, let’s state the obvious: even for a minisite, this is an extremely long landing page—so long that I haven’t even included the whole thing in the image above. But I don’t think the length is arbitrary, or a result of the refusal to edit. It plays a real purpose. For one thing, there’s the novelty of what creator Brett Harris is offering. “Do hard things” is not a common marketing message aimed at his audience of teenagers, and most of them have probably never encountered a pitch for this kind of coaching program. Including comprehensive course details lets visitors preview the experience. Plus, the depth and seriousness of the page is likely to filter out anyone who’s not well suited for Brett’s program. Click here to scroll through this easy-to-read page. What Stands Out: The Social Proof Giveaway Page template is designed to support a simple opt-in offer with quick hits of your most powerful social proof, and fashion-startup accelerator Factory45 makes the most of it. Names like Forbes and the Boston Business Journal lend credibility in the header, while testimonials at the bottom speak to the value (including pure entertainment value) of subscribing to Factory45’s email list. In the middle is the succinct opt-in offer. 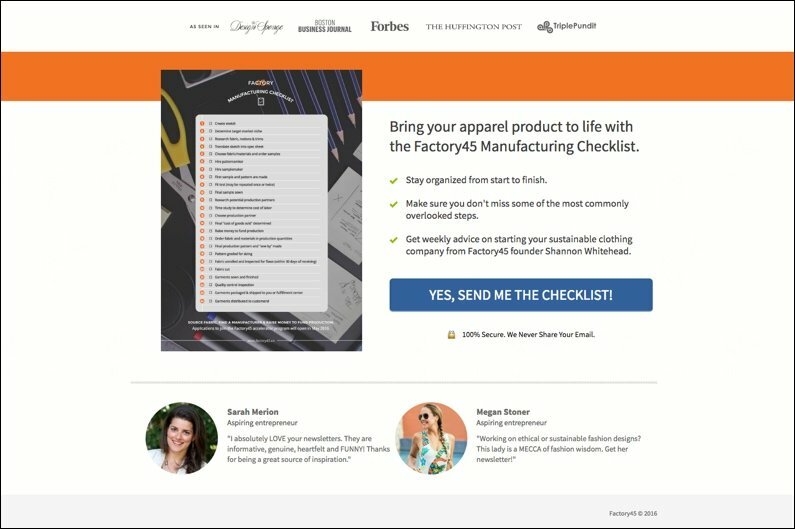 A high-quality image, a few bullets, and a strong call-to-action button are all that’s needed to persuade visitors once Factory45’s social proof has set the stage. Click here to check out this sharp page. What Stands Out: If you’re looking for reliable information on raising your own poultry, there’s probably nothing quite so compelling as seeing happy, healthy chickens in action. Abundant Permaculture uses the Video Background Page to present chicken farming in an extremely attractive, even inspiring, light. Click here to cross the road to this landing page. What Stands Out: You’d expect a personal-image consultant to build a wholly pulled-together landing page, and Leslee Hill certainly does. After you’re done marveling at the savvy use of photography, video, and graphics, it’s worth taking a close look at some of the other content on this repurposed Kirk Behrendt Dental Marketing Page. Up top, Leslee tells her own story in a way that demonstrates her fashion-industry credentials and makes clear why she struck out on a new path. A curriculum breakdown gives just enough detail to get visitors excited, while a rotating testimonials section gives voice to image-confident clients she’s already helped. What Stands Out: The Wedding Shoppe is a St. Paul bridal business with an extremely robust ecommerce presence. One way they do so well online: content-rich landing pages like this one. This page is well positioned to soak up search traffic from brides-to-be on a hunt for lace bridesmaid dresses. But the SEO value would hardly be worth mentioning if this weren’t also a genuinely helpful resource. Styling tips, suggested designers, and photos of The Wedding Shoppe’s recommended styles all show off the store’s extensive inventory and knowledge. Plus, it’s all easy to consume. An info-packed page like this could become overwhelming, but white space and airy fonts and colors make it as easy to browse as a glossy catalog. Click here to get swept up in this page. What Stands Out: With this Call to Action Page, alarm-technology company ipDatatel takes just one selling point—cost savings—and creates a powerful marketing asset around it. 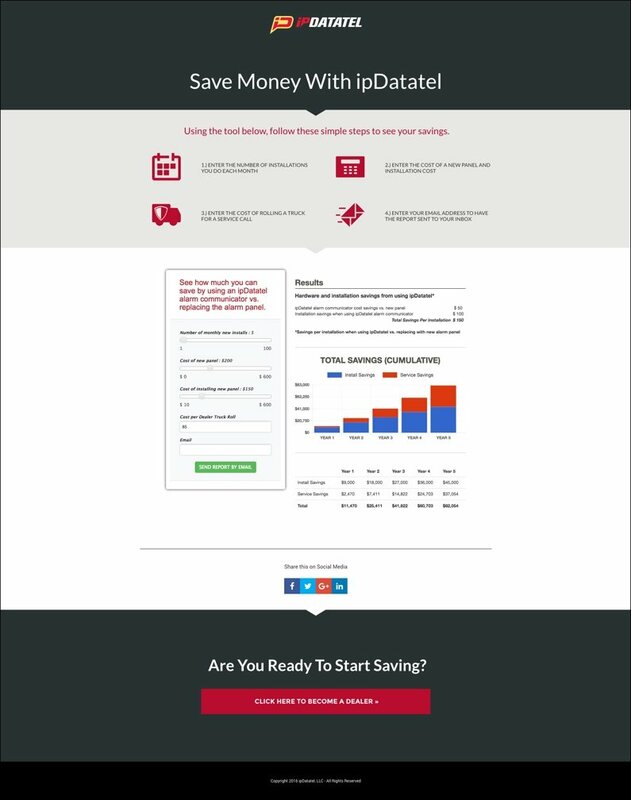 When your main claim is savings, the proof is in the numbers, so the centerpiece of this page is a calculator (embedded using our drag-and-drop builder’s HTML widget). Clear instructions and a sample report let users know exactly what they’ll be getting when they enter their information to see whether this could be a good solution for them. Click here to see how this page adds up. What Stands Out: Expertise matters when you’re choosing a real estate agent to sell your home, but so does personality—and this Testimonial Sales Page has plenty of it. Realtor Tim Mangold begins with a personal video message to prospective sellers. Then, he gets straight into the details of his listing process. Bullet points and colorful icons help visitors take it all in. At every turn, Tim also takes the opportunity to make the different components of his services sound as appealing as possible with phrases like “Hollywood-quality photos and video” and “cutting-edge digital marketing plan”—which he makes sure to back up with detailed breakdowns in each subsection. It makes the home selling process seem like an exciting opportunity, not an onerous checklist of tasks. What Stands Out: This Limited Time Promotion Page 2.0 from Allyson Bright of Determined to Shine gets very real, very fast. She leads with a personal tragedy, yet segues swiftly into an outlook on a hopeful future. The message is clear: she’s overcome major obstacles using the techniques in her art-journaling class, and you can, too. Allyson includes a well-done “What People Are Saying” section, but also works testimonials into other sections of the page. A course breakdown is enhanced by a quote on the class experience, and a testimonial from an initially craft-phobic student reassures visitors that a list of art techniques will be accessible to all. Click here to get inspired by this bright page. What Stands Out: This gorgeous page from freelancing-business coach Gina Horkey makes excellent use of several kinds of proof. There’s the list of media appearances under her hero image and three traditional testimonials spaced throughout the page. Then there are some less typical elements. To prove that Gina truly knows how to build profitable freelance businesses, she includes a profit/loss report breaking down her income and expenses over the first 12 months of her own freelance career. Finally, she includes one testimonial that’s a little less slick but all the more real-feeling for that: a screenshot of a Facebook post from one happy client. Call on this page here. 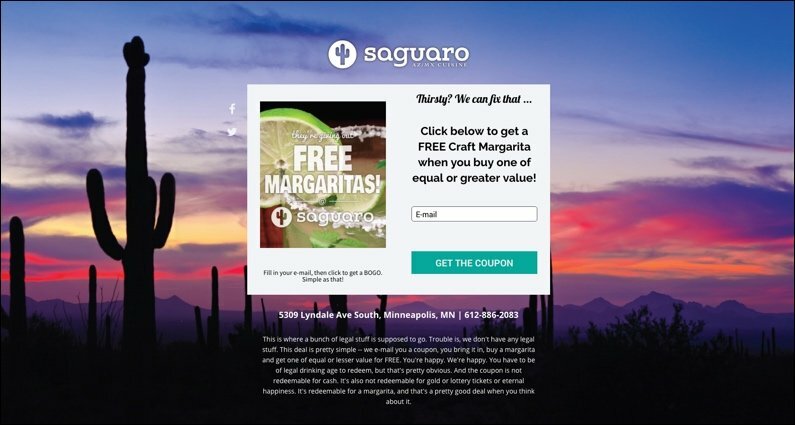 You come away expecting to have a laid-back good time at Saguaro once you grab your coupon and head over. Click here to toast this impressive page. If you’re already a Leadpages member, these templates are ready and waiting for you in your account—just look for the template names listed in the post. If you’re not a Leadpages member, you will need to do a little coding or hand the files over to your web developer in order to customize these pages and publish them to your website. To all of the marketers and entrepreneurs featured in this month’s roundup, thanks for your great work! Before you go, I’d love to hear about your landing pages, whether they’re works in progress or have been released into the wild. If you’ve got a landing page you’d like to share, please add the link and some information about the page and why you’re excited about it to the comments section below. Perhaps your landing page will end up in a future roundup!